If you're feeling tired of the tourist scene in the safari circuit, Katavi National Park will without a doubt cure what ails you. The park is isolated and difficult to get to, but rewards the dedicated visitor with almost unparalleled wildlife viewing during the dry-season. The park is Tanzania's fourth largest at 2795 square miles (4471 square kms). While no scenery in Africa is boring, it is less spectacular than the Serengeti, until you get a glimpse of the park's residents. Abundant throughout the year, the park's rich wildlife population concentrates in spectacular number and variety when water sources recede during dry season. Elephant, giraffe, zebra, lion, eland, gazelle, and many more can be seen, as well as over 400 bird species. The feather in Katavi's wildlife-viewing cap, though, is certainly the hippo pools. As the dry season goes on, water recedes further and further, forcing hippos to gather in ever-tighter spaces. 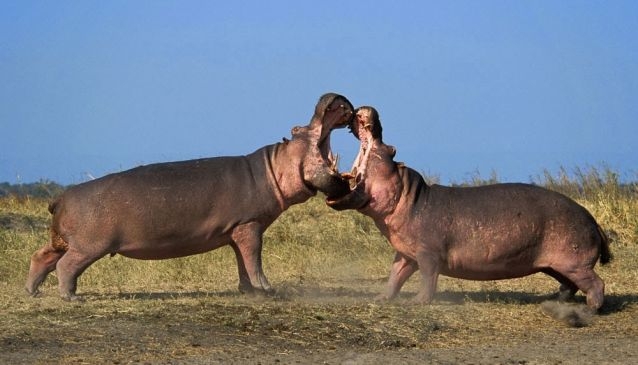 The famously aggressive animals can only take so much close contact, and fights and rivalries between male hippos are frequent and bloody. This rare (in other parks) scene is a unique opportunity to view the raw power of some of Tanzania's most notorious animals. The park headquarters are near the town of Mpanda. You can take the stunning daylong drive all the way from Mbeya (340 miles/ 540 kms) or from Kigoma (dry season only, 240 miles/385 kms). Mpanda can also be reached by public transportation from Dar es Salaam, or from charter flights from Arusha or Dar es Salaam. Basic, decent hotels are available at Mpanda. Basic and Luxury Tented Camping facilities and a rest house are available inside the park itself. Its isolation means services and activities are somewhat limited in Katavi, and mainly limited to camping safaris, walks and game drives. Katavi's game viewing is spectacular throughout the dry season from May to October.